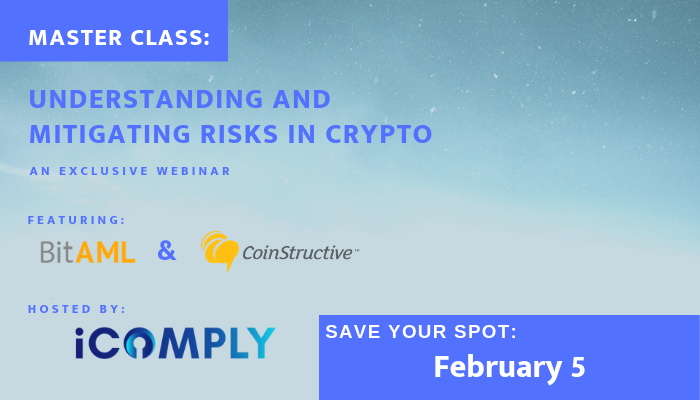 In this upcoming MasterClass hosted by iComply, BitAML’s Founder Joe Ciccolo and Coinstructive’s CEO Chris Groshong join iComply’s Head of Product Strategy Greg Pinn to discuss the importance of understanding and mitigating your company’s risk in crypto compliance and AML screening. 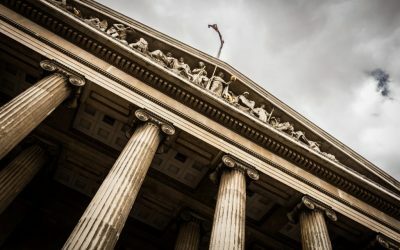 Compliance tends to be one of the larger knowledge gaps for modern business management; closing this gap is not only essential to the success of your business, it’s also the law. Our expert panel will discuss the areas of risk that your business could be subject to and the challenges associated with non-face-to-face transactions. Find out what can be done to mitigate these risks, and learn why regulators will no longer buy ignorance as an excuse for non-compliance. In this MasterClass, the panel will break down the existing risks surrounding digital transactions and what steps you can take to mitigate these risks in order to protect your company and your investors. Formerly the head of World-Check (Thomson Reuters’ most profitable company), Greg Pinn led product strategy for almost ten years—both before and after its $560-million acquisition by Thomson Reuters. World-Check is described as the “cornerstone of the Thomson Reuters risk business” and is the #1 compliance software for KYC, AML, ATF at Tier 1 and central banks globally. Greg’s experience in risk, governance and compliance analysis, product strategy, and leadership of large global development and sales teams were critical to World-Check’s success and now support him in his role to ensure iComply’s brand delivers confidence, trust, and security to all stakeholders. 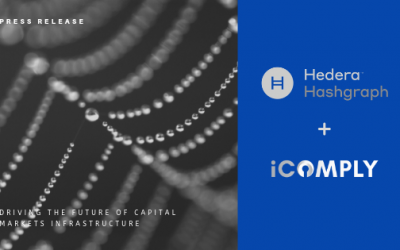 Before founding BitAML, Joe Ciccolo spent over a decade in high-impact roles with leading institutions such as State Farm and Citizens Financial Group. He was a founding member and architect of a Bank Secrecy Act / Anti-Money Laundering program for one of the top 100 online financial institutions in the U.S., and worked as a project manager for a top-20 international bank, managing regulatory and AML audit remediation projects. His additional leadership experience includes risk management, vendor due diligence, fraud prevention, and corporate investigations. Joe regularly consults with bankers regarding the onboarding of Bitcoin customers, as well as complex cryptocurrency-related investigations involving federal and local law enforcement. He is a frequent speaker at cryptocurrency, payments, and compliance industry events and volunteers his time at the non-profit organization Blockchain Education Network. As President of CoinStructive, a Bitcoin & Blockchain consulting firm in San Diego, Chris Groshong has developed a nationwide team that is furthering the development of cryptocurrency and blockchain adoption. With a focus on clarity, CoinStructive provides an obstacle-free transition for businesses and enterprises who are interested in using cryptocurrencies or blockchain tech as part of their business strategy. They are solutions architects and problem solvers and help fill the gaps in your business model. CoinStructive’s fundamental goal is not only to help organizations reach theirs but also to do so in a way that empowers founders, boards and entrepreneurs to make educated, well-informed, and confident business decisions. Why Do We Need AML?